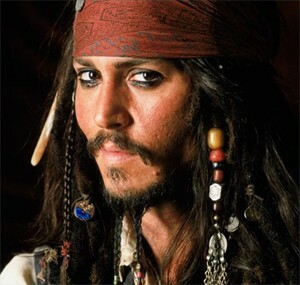 Snippets of Jack: "I Love Your Eyes"
As we all know, Captain Jack Sparrow is a huge fan of eye liner. But what you might not know is why. I mean, most people believe that it's because Johnny Depp, who does a magnificent job playing our favorite pirate, always have to look wonky in just about every movie. Which still holds true, but there's is a logical explanation for all this make up which is explain in A.C. Crispin's novel, The Pirates of the Caribbean: The Price of Freedom. As we have mentioned before, Jack has a close lady friend, a pirate like himself, Lady Esmeralda. Well, she runs into Jack while he is first mate on the Fair Wind, a merchant ship for the East India Trading Company. She invites him over for dinner on her ship. Of course, once the two are alone together, Jack tries to charm her, commenting on her very nice eyes. Jack: "You're eyes. I love your eyes. The way you've enhanced them. What did you do?" Esmeralda: "A little trick I picked up in the east. It's called kohl. They all outline their eyes there, in that part of the world, both men and women. The sun is so hot, and it helps protect against thee glare of the water. It also helps prevent infections. You should try it, Jack. It would look wonderful on you. Let me show you." And so the obsession begins. Esmeralda applies the kohl above and below his eyes. Jack approves of it: "Thanks love. I like it. I'll have to remember this next time I'm in the east." Esmeralda: "Oh, they sell it in Tortuga. You know Tortuga." We all know the lovely city of Tortuga, but that is a post in and of itself. But since Jack is now working for the EITC, he doesn't visit the pirate port of Tortuga any more. That is, until he gets the Black Pearl to himself. And of course, his first stop is Tortuga, where he gets himself that lovely kohl eyeliner and we see it constantly on him ever since. But let's not forget the time when Jack goes a little overboard on make up when he is trapped on the cannibal island in The Pirates of the Caribbean: Dead Man's Chest. Wasn't that a lovely image? Once Jack has this lovely stuff on, he realizes that Esmeralda was right about it: it does prevent the glare of the sun. And down in the Caribbean and Africa (where much of the book takes place), the sun is stronger since it's closer the the equator. As well, as protecting his eyes from getting hurt (and who wants a blind captain? No offense to Mistress Ching, she's just no Jack Sparrow), it also prevents infections. And our dear Captain Jack Sparrow cannot catch some nasty sea infection and die on us, can he? There is a method to the madness.